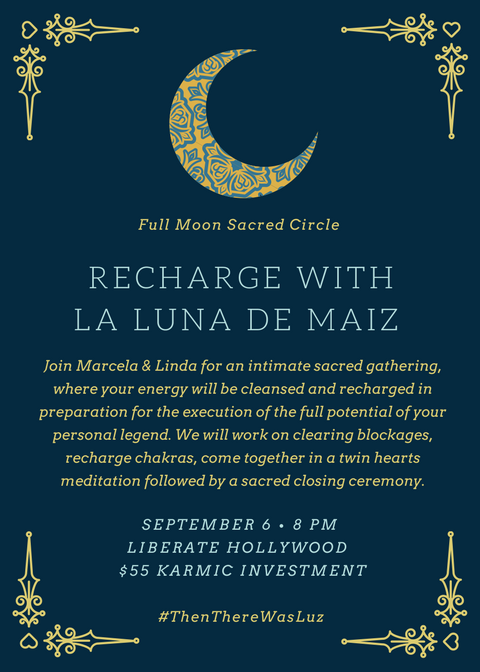 Marcela and Linda are thrilled to invite you to their first intimate Sacred Circle in honor of La Luna de Maíz at Liberate Hollywood Wednesday, September 6th. This will be an evening filled with magic and personal breakthroughs! What to bring? Please bring your intentions from the New Moon on August 21st, they can be brought on paper, projected in stones or simply carried in your heart. We will be recharging your intentions and releasing any part of the intention that does not serve you, this will help with clarity and blockages. You will receive our Energetic Self-Care Pack valued at over $60 to take home. Please wear comfortable clothes and be prepared to remove your shoes before entering the sacred meditation space. We will be providing meditation pillows. Where? Liberate Hollywood formally known as Hollywood Sound Recorders where Prince, Micheal Jackson, Madonna and Earth Wind and Fire all recorded platinum records. There is powerful creative energy culminating, the rooms have been restored and infused with natural stones and crystals. The first part of our event will take place in the Main Hall and we will move into a sacred Meditation Room. Parking: There are two parking structures in front of and behind Liberate Hollywood for a $10 flat rate. We do not recommend parking in metered parking since the event is scheduled for 2 hours and once we enter the mediation room we will be closing the door with no interruptions. Once our guest list is finalized we will reach out for potential interest in carpool. $55 Karmic Investment Ticket here.